It was an excellent 2017 for pizza lovers all around the globe. The worldwide pizza market is $134 billion and the U.S. pizza market is $41.1 billion. Chains have been very successful, opening 2,124 pizzerias in 2017 and closing 1,170 pizzerias. Independent establishments have not fared as well, opening 2,868 stores in 2017 while closing 4,121 pizzerias. However, the high amount of closures from independent pizzerias does not necessarily mean they are suffering. In fact, they make up a majority of the market. CHD Expert reports that there are 33,515 chain pizzerias in the U.S. while there are 41,728 independent pizzerias. Customers still enjoy their local independent pizzerias – preferring the unique atmosphere, personalized customer service and their community-minded approach to business. The rise of fast-casual pizza relies on consumers’ need for quality ingredients that are readily available. Unlike fast food, fast-casual pizzeria chains such as Blaze Pizza, have found that promoting choice is essential to the brand’s message. The menu caters to customers individual preferences. Customers can choose their desired toppings, whether they want organic cheese, or gluten-free crust. Customization is key to ensure diners receive exactly what they want, and 2017 demonstrated that what people really wanted were plenty of choices and pizza cooked with quality ingredients. Technology proved to be a driving force for business in 2017. In many pizzerias, online ordering is now the primary customer interaction with the menu and restaurant. It allows customers to easily view menu options and customize the order, track the order in real time, and provide immediate feedback on the speed of the delivery as well as the quality of the food. Social media is also a “must have” technological element to reach customers and drive new business. Social media allows for a pizzeria’s custom creations to be featured and hopefully raved about on numerous customers’ social media accounts. It provides a great platform to interact with customers and promote the pizzeria on a more personal level than a traditional print, radio, or television advertisement. However, there are wrong ways to go about building a strong online presence. PMQ Magazine listed the most common missteps that pizzerias make on their social media pages, starting with promoting sales and offers too much. People do not want to be constantly bombarded with ads on their timeline, so it is crucial to personally engage them as well as sell to them. It is recommended that 80% of the time, businesses post engaging content. For the other 20%, they can post coupons or special sales. It is also important to be very clear in social media posts, outline realistic goals, and measure social media success based on how engagement from followers online translates into dollars. 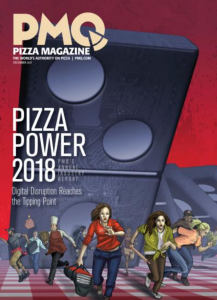 The major takeaway from this year’s Pizza Power Report is the consumer desire for customization and quick delivery. Technology will just keep on progressing and transforming industries, so it is vital to keep up with its exponential growth. We can expect the modernizing trends of 2017 to carry over into 2018, with the emphasis on creating a personalized atmosphere for the customer. Over the next twelve months, new trends will emerge for both independent pizzerias and chains alike. It is important to understand the trends that helped shape 2017 and be prepared to stay on top of new changes in 2018.